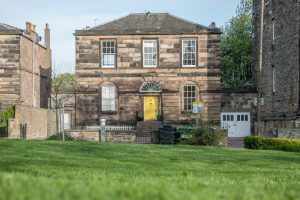 We are based in a large detached villa set back from Bruntsfield Place, overlooking the bottom section of Bruntsfield Links. We are registered for 76 Children. The nursery is spread over 3 floors and has a substantial rear garden with different areas to support children’s learning and curiosity. Bruntsfield Place is accessible to the 11,16,45 and 23 bus routes. The nursery also has a drop off car park at the front of the building.